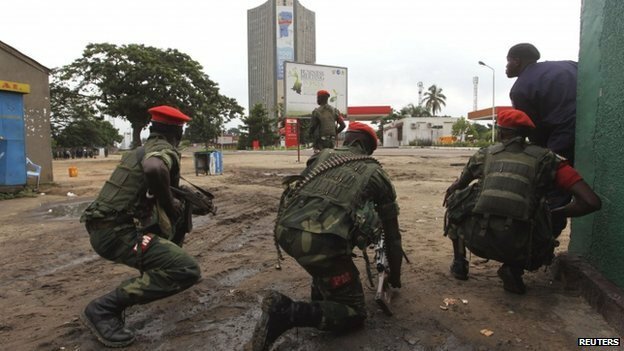 An attack on the military barracks of the presidential guards in Kinshasa has been repulsed, the Democratic Republic of Congo government has said. The situation is now under control and a small group of “infiltrators” defeated, the government said. Heavy gunfire earlier rang out from Camp Tshatshi for about 30 minutes. DR Congo has a history of instability, with President Joseph Kabila taking power following the assassination of his father, Laurent, in 2001. The authorities have not said who was behind the attack. Residents were evacuated from the area around Camp Tshatshi and the international airport was reportedly closed. An unnamed presidential guard officer told the AFP news agency that about 20 people wearing civilian clothes had been overpowered. Another soldier told Reuters that four of the attackers had been killed. An attack on Camp Tshatshi was also repulsed in December 2013. That was blamed on followers of Paul Joseph Mukungubila, a Christian leader and self-proclaimed prophet, who unsuccessfully ran for president in 2006.
Who was behind Monday’s weird attack in Kinshasa? Who was behind Monday’s weird attack on Kinshasa? Posted on 23rd July 2014 by newsafrica. This entry was posted in Africa, DRC, Tribalism and tagged Agence France-Presse, BBC, Camp Tshatshi, Congo, Democratic Republic of Congo, Joseph Kabila, Kinshasa, Reuters. Bookmark the permalink.